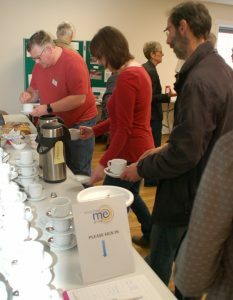 The 2018 Shropshire ME Group annual conference brought together members of Shropshire ME Group and guests from across the county to hear about research projects currently underway. 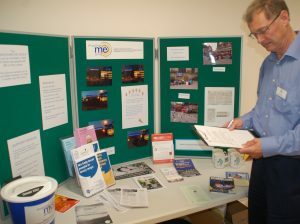 With support information form Shropshire ME Group and other local partners, this was also an opportunity to visitors to seek advice and to meet socially with others who have M.E. or care for someone with the illness. In a time where M.E. 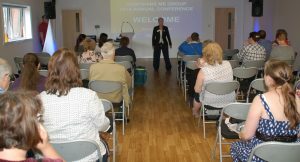 has been thrust into the limelight thanks to the film Unrest and the current review of treatment guidelines from NICE, it was exciting to hear about the work of our guest speakers and to meet with members and guests from across the region. Before our speakers stepped up to the mic, we were able to show a 20 minute extract of the remarkable film, Unrest. Following the story of Jennifer Brea and her fight with M.E., the film brings a ground breaking insight into life with this debilitating illness. We were delighted to share a small section of this film before getting under way with the rest of the afternoon’s programme. If you are yet to watch Unrest, further details about the film and where you can purchase a copy from can be found at our Unrest page. Welcoming everyone to the conference this year was our group secretary, Maralyn Hepworth. Maralyn, despite battling the symptoms of M.E. 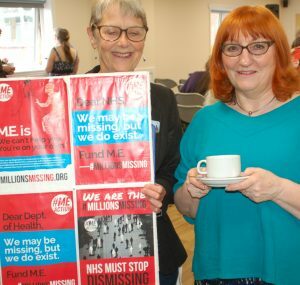 herself, has worked tirelessly behind the scenes at Shropshire ME Group to support our members, as well as being at the forefront of many campaings fighting for better treatment for M.E. sufferers and for much needed investment into research programmes. We are grateful for her work in planning this year’s conference and her contribution throughout the day. Maralyn will be taking on a sponsored challenged of climbing this Wrekin this June, all in aid of raising money for Shropshire ME Group. For details of her event and ways in which you can support Maralyn, please click here. 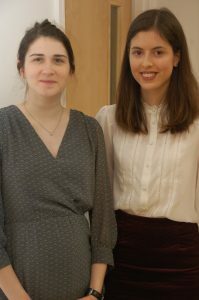 Fiona Newbury and Katharine Seaton are PHD students at The Quadram Institute based in Norwich. We were encouraged by the research programmes they are currently involved in, exploring the gut microbes and micro biomes that may be linked with M.E. We are very grateful to Fiona and Katharine for taking the time to travel to Shropshire and speaking to our members and guests. We hope you like the mugs we sent you home with! We have already begun to plan for next year and hope to bring another event that will appeal to all members and guests, so please continue to check our website and social media for details. If you have ideas of content you would like to see at the next conference, please use our contact page to tell us about your suggestions or feedback from this years’ event.